Successfully Added Conquest S6 Pro 4G Rugged Smartphone - 3GB RAM, IP68, Android 5.1, 64GB Memory, 5 Inch Screen, Octa Core (Black) to your Shopping Cart. What to look for in a good rugged smartphone? The Conquest S6 Pro holds all the answers. You have a large 5 inch screen with Gorilla Glass protection, IP68 waterproof rating, 4G connectivity on two SIM cards, an Octa Core processor, 3GB of RAM, a 6000mAh battery and more. The Conquest S6 Pro will not only let you talk to your heart’s content, but can also double as a powerful outdoor survival tool with its wealth of sensors and GPS location technology. It offers 16 hours of uninterrupted talk time and 700 hours on standby. The large battery is big enough to charge up other gadgets on the go. The smartphone comes with a 5 inch screen with the 1280x720 resolution. It’s great for having fun with all your media and is also reliable thanks to its Gorilla Glass protection. With Android 5.1, you will have an improved interface at your service as well as access to the Play Store to pick up more apps, tools and games. The S6 comes with quad band connectivity including 4G – and offers that on two SIM cards. This will let you efficiently manage your professional and social lives from two different accounts. The smartphone comes with IP68 rating and is dust tight and waterproof – it can even be immersed in water at 1 meter for up to 30 minutes. The rugged smartphone can be used as a navigator, as it comes with built-in GPS. Bluetooth 4.0 ensures fast and smooth connectivity with other devices and the support of NFC and OTG make for quick and efficient data transfers. You will also be able to take pictures or snap a quick selfie with the phone’s two cameras: 5MP front and 13MP back. 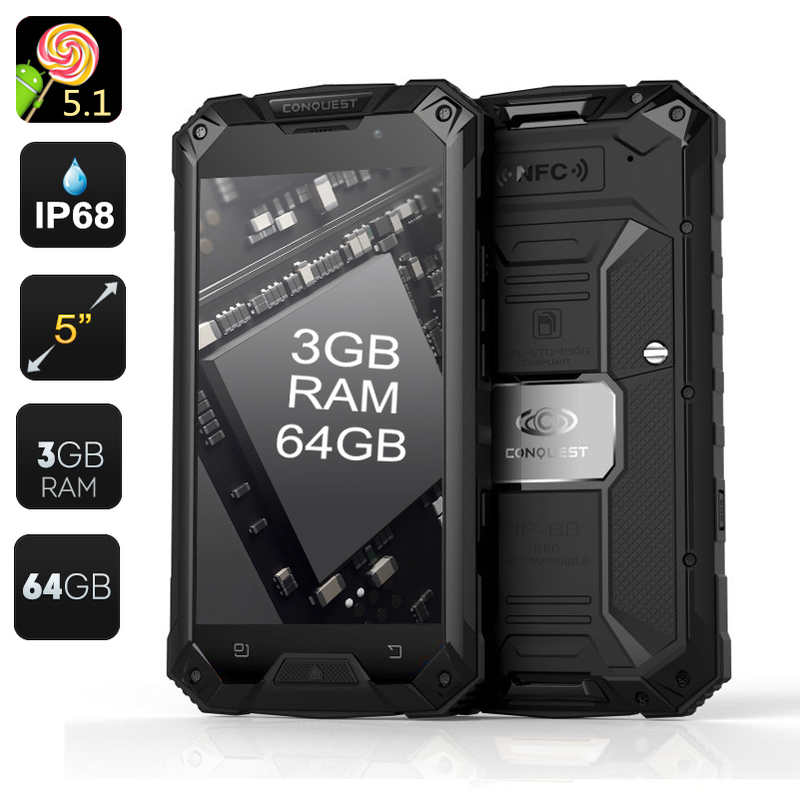 The Conquest S6 Pro 4G rugged smartphone comes with a 12 months warranty, brought to you by the leader in electronic devices as well as wholesale Android Phones..